The initial selection of the processor type to be utilized during the design of an embedded system has the most dramatic impact on the overall system design. 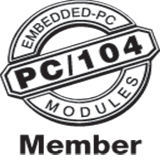 The PC/104 Embedded Consortium recently announced plans to release a variant of the PC/104 form factor that incorporates PCI Express serial bus architecture. The incorporation of PCI Express into the PC/104 form factor has tremendous potential for the future of the embedded system. This Fundamentals 101 column will study PCI bus limitations and the strengths of PCI Express. The PC/104 embedded system design issue of efficient internal cabling and will provide helpful information to aid engineers in eliminating some of the common problems that internal connectors and cabling can cause.